How do I choose a greenhouse? AIn an ideal world, with plenty of suitable land on which to site your new greenhouse and cost is not an issue, the growing capacity you require is likely to determine the size and style you finally choose for your new greenhouse. Without space and budget constraints your choice is vast! Keen amateur gardeners may choose a small greenhouse (6' wide by 10' long), while gardeners who require a much bigger growing capacity might opt for a large greenhouse, for example 10' wide by 14' long. However, back in the real world, our experience is that for most people, choosing a greenhouse inevitably involves a trade-off between the growing capacity (and therefore size of greenhouse) you would ideally like and the actual physical space you have in your garden to put it! In short, your eventual choice of new greenhouse is likely to boil down to how much space you have available in your garden that catches most sunshine and which can be easily levelled to provide good foundations and has convenient access. Assuming space in your garden is not an issue, this largely depends on how much growing you are planning to do, and to a lesser extent how much storage space you will need inside your greenhouse. However, most gardeners know that the most common complaint about greenhouses is that they are too small! We therefore advise you to choose the biggest greenhouse you can accommodate in your garden and can afford. If for example you were thinking of buying a 6'by 8' then, if you have the space and budget, consider upgrading to a 6'by 10'.You'll be amazed at the difference in usable space this will give you! What are the most common styles of greenhouse? 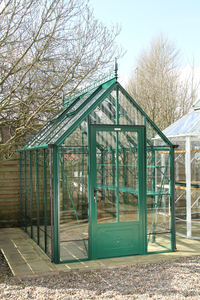 Essentially, there are three distinct greenhouse styles available to choose from,Traditional, Lean-to or Octagonal. 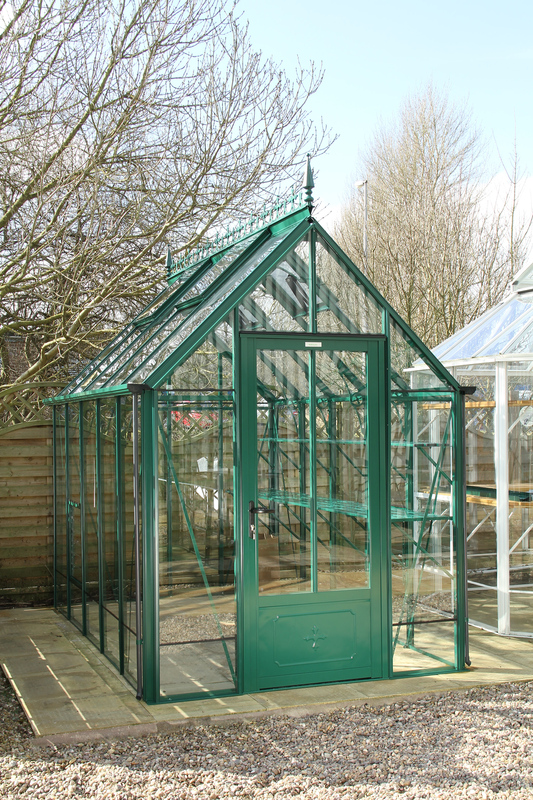 The traditional or freestanding greenhouse is the UK's most popular style. Because they are available in so many sizes (i.e.many widths and various lengths) it's likely that you'll find a suitable space in your garden to site one. 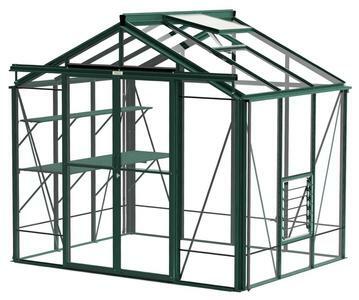 An octagonal style of greenhouse makes a delightful garden feature that is still practical for housing your seedlings and plants when optional shelving sections are added. The lean-to style takes advantage of an existing wall, for example a south facing house or garage wall. A big advantage of a lean-to is that the wall itself acts as a storage heater by releasing the stored warmth of the sun into the greenhouse during the night, so creating a good growing environment. How do I maximise growing capacity? 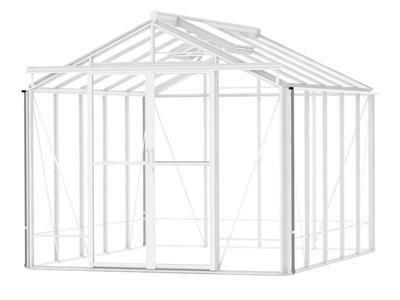 The average starter greenhouse is our top selling 6' by 8' i.e. 6' wide by 8' long. Although this is classed as a small greenhouse, it provides enough room inside to install an 8' length of two-tier staging, with additional shelving above, placed down one side. This is an ideal working bench with enough space to keep your potted plants. On the opposite side of the 2'pathway there is still space for a row of grow bags for tomatoes or other tall plants and additional shelving. This case illustrates how the effective use of a mix of shelving and staging can significantly increase the growing capacity of even a small greenhouse. What sort of greenhouse base will I need? Traditionally, greenhouses always used to sit on a little brick plinth. 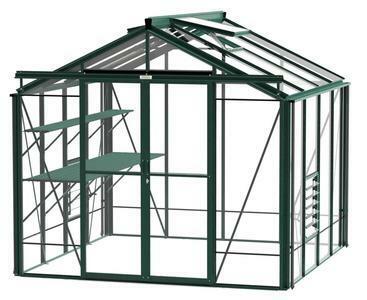 Now however, most of the greenhouses in our range are supplied complete with a metal base. This means that you can fix the greenhouse straight onto either a concrete footing or a base made up of concrete slabs. Greenhouse manufacturers make various types of metal base.Using our experience of installing greenhouses we decided to offer our customers a base design that incorporates all the best features of these bases but which is simple to install and much stronger in order to achieve an improved life-span. Our galvanised metal bases include anchor legs in each corner, more on greenhouses of 10' length or above. This design allows you can anchor your greenhouse straight into the soil by digging a hole in the ground under each anchor leg and then use concrete to secure the legs into the ground. However, while this method maybe satisfactory, we would strongly advise that you should always have a solid concrete or paving slab foundation under you greenhouse, especially if it is larger than 6'by 8'.